Individual taste in books varies as much as the favorite rod or fly. With that in mind, we hope to review books and videos from the ever-growing fly fishing world, and share them with you. Books will be the best of all worlds, new and old. Many of the old books are now available in reprint, and the wisdom contained is timely today. Others can be found in second-hand book stores, or by mail order dealers. As we find videos we feel are outstanding they will be included. Be assured, reviews are based on what we have actually read or viewed, and due to that fact, may not appear weekly. All through the summer of 2013, though I was busy guiding, my interests for Atlantic Salmon Flies were lingering and growing in my mind. As September rolled around my guiding schedule got slightly loose so I started to look for materials and a textbook to get me started. I contacted the fly-dresser I met in June, explained my situation and what I wanted to do, and asked if we could work together. Our first assignment was Green Highlander. I knew I was not tying trout flies, which I can do in several minutes and I can clip off all the materials to start over if I don't like what I've just done. With careful maneuvers and attention, from start to finish Atlantic Salmon Flies require several hours per fly! Though I have not reviewed these for this series, I own and have watched Poul Jorgensen's and Mike Radencich's tying instructional videos. I would start with great concentration of mine. The fly on the vise would still look good in the middle. Now I would start working on wings and rest of procedures to the finish. That was when things started collapsing one by one. It was like a dating relationship; it would turn unspectacular yet barely hanging on till saying good-bye formally. Every time I finished one, it was a great grief. 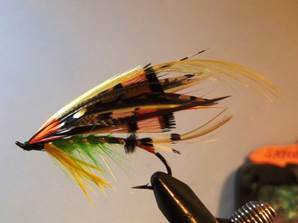 Then again, it wasn't a trout fly that I could re-do quickly. Furthermore, the materials I was employing were limited and more expensive than those for trout flies. Here, I wouldn't mind showing you one out of my several attempts with lots of novice mistakes. I tried several flies and all ended like this. I started to wonder if what I was wishing for would ever be achieved and started to doubt my ability. That was when I contacted my mentor for help, which became a long-lasting apprenticeship. Regardless of my initial struggles, choosing this book (Stackpole Publishing, ISBN-13: 978-0-8117-0523-3, ISBN-10:0-8117-0523-4) as the first textbook was a right decision. Even in my length of involvement, I'm sure Mr. Radencich has done the biggest contribution for learning and dressing Atlantic Salmon Flies in modern approaches. This is the third book out of his four seminal works (apparently I will review the rest of three). 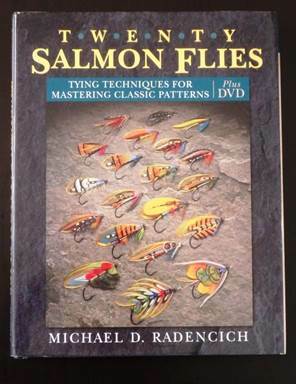 Because I had already had my initiation with Atlantic Salmon Flies and accomplished the skills necessary to tie trout flies I wasn't looking for a basic book. I wanted/needed to tie and learn patterns. This book fit my needs/wants/expectations just right. Each chapter consists of two flies in the same category and complication. As you flip pages and complete one at a time, following the chapters/flies become more complicated and challenging. You will be using what you have learned/read from previous chapters/patterns for next chapters/patterns. It's like a drill: you will accumulate lots of knowledge and skills by the end!! The book comes with a 2-hour long DVD that covers each technique shown in this book (not the entire procedures to complete one fly). Though I don't claim to have completed all twenty pattern listed in this book, I still look back every now and then. Even when I'm working on patterns that are not discussed in this book, some techniques and material handling techniques mentioned in this book can be applied. Indeed this book should satisfy every reader with any levels of attitude and expectation. 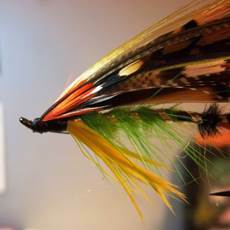 Satoshi Yamamoto, www.leftyanglerandflies.com, is an outfitter and a fly-dresser in Livingston, MT.